Step on the Ultrex foot pedal and feel what Power Steering does to a trolling motor. Then tap the Spot-Lock button to stay on a fishing spot automatically. Only Ultrex combines the most responsive, intuitive steering ever with GPS-powered automatic boat control. The only thing we didn't do to it, is compromise. Select models now available with Built-In MEGA Down Imaging. Power Steering: The most comfortable, responsive steering available. Ultrex's foot pedal is built for all-day ease, with precision control and instant responsiveness. Steering Lock: When you take your foot off Ultrex's foot pedal, the motor head remains pointed in the direction you left it. No recoil or readjustment, just easier steering every day. Spot-Lock with Jog: Spot-Lock will hold you in place with unparalleled GPS accuracy. Available on i-Pilot GPS system that is pre-installed, Spot-Lock gives you the power to stay right on top of any productive fishing spot, without touching your trolling motor. With the included heading sensor, you can use Jog to move your Spot-Lock location five feet in any direction. 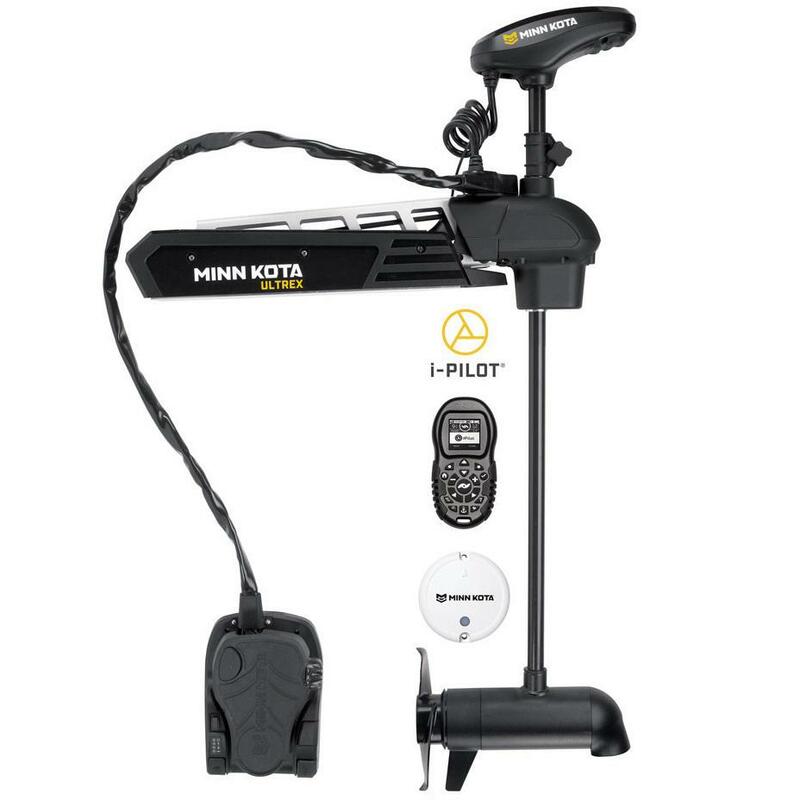 Activate Spot-Lock from the i-Pilot remote or Humminbird fish finder. Lift-Assist: Ultrex's patented Lift-Assist Design cuts the weight of stow and deploy in half. Features a stainless steel, nitrogen gas-charged spring. Universal Sonar 2: Keeps your transducer and wiring completely concealed and protected, running everything through the trolling motor's shaft, with shielded connectors. Heel-Toe/CableFoot Pedal: It's the only foot pedal with Power Steering for all-day comfort and instant responsiveness — plus a button to activate Spot-Lock electronic anchor. Integrated Battery Meter: The i-Pilot remote can tell you the exact charge left in your trolling batteries, so you know how much time you have left on the water.